Facet joint injections are commonly used to determine what is causing back pain. Facet joint injections are primarily diagnostic injections, meaning that they help your doctor determine the cause of your back pain but may not provide you with any long-term relief from the pain. Injections eliminate pain temporarily by filling the facet joint with an anesthetic medication that numbs the facet joint, the ligaments, and joint capsule around the facet joint. If the facet joint is injected and your pain goes away for several hours, then it is very likely that the joint is causing your pain. Once you and your doctor know what structure is causing your pain, you can begin to explore options for treating the condition. Anatomy of Facet Joint– Between the vertebrae of each spinal segment are two facet joints. The facet joints are located on the back of the spinal column in the lumbar and thoracic spine. In the neck, or cervical spine, they are located on the each side of the vertebra. There are two facet joints between each pair of vertebrae, one on each side of the spine. A facet joint is made of small, bony knobs that line up along the back of the spine. Where these knobs meet, they form a joint that connects the two vertebrae. The alignment of the facet joints of the spine allows freedom of movement as you bend forward and back. The surfaces of the facet joints are covered by articular cartilage. Articular cartilage is a smooth, rubbery material that covers the ends of most joints. It allows the bone ends to move against each other smoothly without friction. Each joint is surrounded by a joint capsule. The joint capsule is made up of the ligaments and connective tissues that help hold the joint together. The joint capsule forms a water tight sac that contains the joint fluid. During a facet joint injection, the tip of the small needle is placed inside the joint and the joint is filled with medications to anesthetize (or numb) the joint and reduce the inflammation in the joint. Recomendation– Facet joint injection to try and determine if the joints are the cause of your back pain. This type of injection is primarily a diagnostic injection. The injection may only help your pain temporarily, sometimes just for a few hours. Once your doctor is sure that it is the facet joint causing your pain, other procedures may be recommended to reduce your pain for a longer period of time. During a facet joint injection, the medications that are normally injected include an anesthetic and cortisone. The anesthetic medication (such as novocaine, lidocaine or bupivicaine) is the same medication used to numb an area when you are having dental work or having a laceration sutured. The medication causes temporary numbness lasting one hour to six hours, depending on which type of anesthetic is used. Cortisone is an extremely powerful anti-inflammatory medication. When this medication is injected into a painful, inflamed joint, it can reduce the inflammation and swelling. Reducing the inflammation reduces pain. If cortisone is also injected into the joint at the same time, you may get several weeks’ worth of relief from your pain. This can allow you to get started in a physical therapy program, strengthen the muscles, and begin normal movement again. When the cortisone wears off, the pain may not return. When you are ready to have the injection, you will be taken into the procedure area and an IV will be started. The IV allows your doctor to give you any medications that may be needed during the procedure. The IV is for your safety because it allows a very rapid response if you have a problem during the procedure, such as an allergic reaction to any of the medications injected. 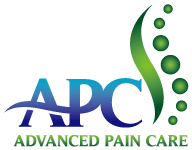 If you are in pain or anxious, you may also be given medications through the IV for sedation during the procedure. Facet joint injections are done with the help of fluoroscopic guidance. 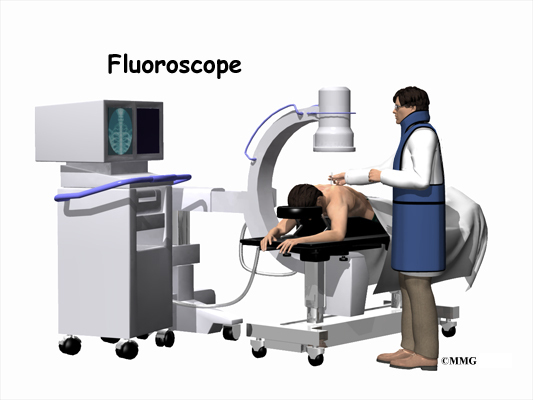 The fluoroscope is an x-ray machine that allows the doctor to actually see an x-ray image while doing the procedure. This allows the doctor to watch where the needle goes as it is inserted. This makes the injection much safer and much more accurate. Once the needle is in the right location, a small amount of radiographic dye is injected. This liquid dye shows up on the x-ray image, and the doctor can watch where it goes. The anesthetic medication and the cortisone will go in the same place. The doctor wants to make sure the injection will put the medication where it can do the most good. Once the correct position is confirmed, the anesthetic and cortisone are injected, and the needle is removed.